What is your favorite thing about summer? Is it a vacation, longer days for outdoor activities, beautiful sunsets, or more time to grill, baby! Grilling makes the summertime better with terrific food and more time outside. Next up in the Summer Grilling Spectacular are Kalbi Ribs and Grilled Corn with Kalbi Butter. Featuring Korean flavors, these beef short ribs are paired with grilled corn and a salt charred okra relish. Begin preparing the marinade by pureeing vinegar, olive oil, sambal, fish sauce, and garlic. Brush the ribs with the marinade and let them sit and rise to room temperature for even cooking. 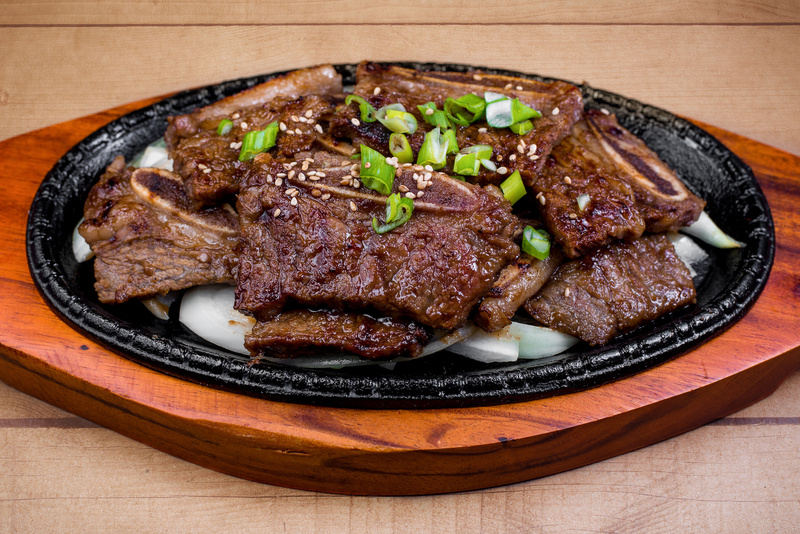 The Kalbi butter for the grilled corn simply combines some of the marinade with softened butter for spreading. The salt charred okra relish features roasted poblano, charred okra, fish sauce, shallots, and vinegar for a dark and salty counterpart to the rich short ribs. Grilling the corn on the grill unlocks wonderful sweetness, while the ribs finish caramelized, charred, and succulent. So fire up the grill, grab an iced beverage, and enjoy your favorite part of summer with the Summer Grilling Spectacular. In a food processor, puree the vinegar with the olive oil, sambal, fish sauce, and garlic. Transfer 1/2 cup of the kalbi marinade to a bowl. On a large baking sheet, brush the ribs with the remaining marinade and let stand for 30 minutes to 1 hour. Meanwhile, in the processor, pulse the butter until smooth. With the machine on, gradually add the reserved 1/2 cup of kalbi marinade. Scrape the kalbi butter into the bowl. Light a grill. Brush the corn with kalbi butter and grill over moderately high heat, turning and brushing with more butter, until lightly charred, 5 to 7 minutes. Transfer to a large platter. Season the ribs lightly with salt and grill over high heat, turning once, until nearly cooked through and lightly charred, 4 to 6 minutes. Transfer to the platter and serve with the okra relish. Light a grill. Grill the poblano, turning, until charred all over. Transfer to a bowl, cover tightly with plastic wrap and let cool. Peel, stem, and seed the poblano, then cut into 1/4-inch dice. Brush the okra with oil and season with salt and pepper. Grill over high heat, turning until lightly charred all over, 3 to 5 minutes. Let cool, then cut off the stems and slice the okra crosswise into 1/4-inch rounds. In a medium bowl, toss the okra with the poblano, fish sauce, shallot, and vinegar. Season with salt and pepper and serve.